To make my jewelry as eco-friendly and socially-responsible as possible, I mine many of the gemstones myself. This past weekend, my husband Jared and I went mining at a crushed stone quarry in Maine. Neither Jared nor I love mining at commercial quarries, as we don't enjoy seeing this large scale disruption of the natural Earth. But during this visit, we realized that we are glad to have been there, to rescue the amazing crystals that were created by the Earth from being crushed for gravel. Here's a picture of a perfect garnet, exactly how I found it. Isn't that color and shape incredible?! 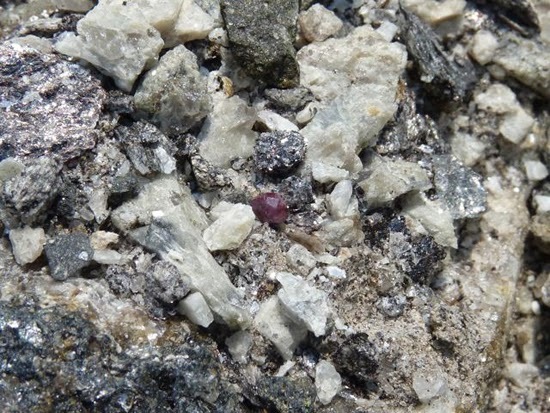 Sometimes the garnets can be found loose, as in the photo above, and other times they are still in the host rock. Jared found a large rock that contained many small garnets, which he removed very carefully using a chisel and small sledge hammer. It took some time to remove the garnets, but he was very happy once he got them out! Here's a picture of one of the gorgeous garnets he removed from that large rock. I can't wait to use this beautiful little gem in a piece of jewelry, using eco-friendly recycled sterling silver. I'll be sure to post it on my website and share photos with you once I do!